Truckloads for BrokersSeamless way to find qualified carriers to move America’s freight. Truckloads for CarriersVoted best load board app in 2016. Use it on-the-go or at your desk. 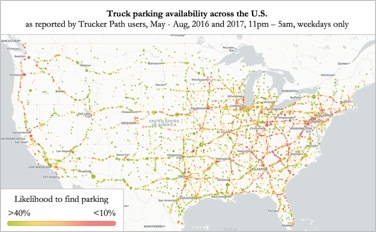 Trucker Path, the most popular app for truckers in the U.S., released the 2018 Truck Parking Report today, an annual white paper that explores the issue of truck parking in the U.S. and possible solutions. Failure to find truck parking is a significant problem with serious social and economic consequences. This comprehensive and detailed report equips trucking companies and industry leaders with the information they need to navigate the challenges of truck parking, optimize their business, and work towards a stronger, more efficient trucking industry overall. “We realized that we have a vast amount of truck parking data in our app as well access to a large trucker community, so we explored the problem in depth. By surveying over 5,500 drivers and analyzing millions of data points, we have come to some useful conclusions that we wanted to share with the industry,” says Chris Oliver, Chief Business Officer for Trucker Path. Failure to find a spot within the hours of service (HOS) limit puts many drivers at risk of parking in unauthorized areas, thus making the job more stressful with 85% of drivers citing parking as the number one cause of stress at work. Due to failure to find a spot, 70% of truckers have had to violate HOS, and 96% have parked in areas not designated for trucks. In addition, 48% of drivers spend an hour or more to find safe truck parking, which is essentially driving time that does not translate into fleet revenues. The annual loss per driver is estimated at $6,000. 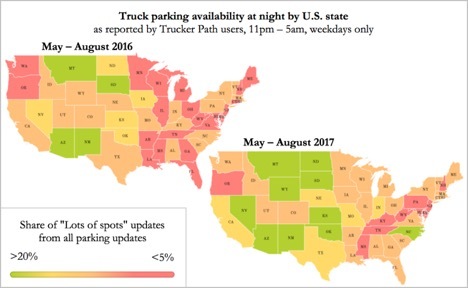 While Trucker Path parking data suggests that average truck parking availability improved in almost every U.S. state between 2016 and 2017, there are still areas in the Eastern United States, especially around urban centers, that have a severe lack of capacity. Today, the largest impact could be achieved via spreading out the need for capacity throughout the day as the vast majority of drivers park at the same time. FMCSA is already making positive changes by revising personal conveyance rules allowing truckers extra time after the HOS limit to find parking. If that doesn’t work, capacity could be expanded by utilizing weigh stations and shipper facilities as truck parking locations. Our survey shows that truck drivers find shipper facilities almost as safe as truck stops. Building new capacity is expensive, but may be needed in some areas, as shown in our truck parking heatmap. Trucker Path is America’s largest trucking community with over 750,000 individual truck drivers as monthly active users, equating to roughly 35 percent of all long-haul truckers. The exponential growth of the Trucker Path app led to the release of Truckloads, an online marketplace connecting freight brokers with hundreds of thousands of members truckers via the web and mobile devices. In early 2018 the company was acquired by Renren, Inc. (NYSE: RENN) followed closely by the launch of the Trucker Path ELD solution in March of 2018. The Trucker Path team strives to bring efficiencies to the freight transportation industry while making life on the road easier, more enjoyable, and more profitable for truck drivers. Brake Safety Week is almost here. Are you ready? © 2019 Trucker Path Inc.